“You can’t have it all,” is a common thing parents tell their children (admittedly, since becoming a dad, I’ve dropped that one more than a few times). And it’s true, but that doesn’t make the want any less. When it comes to Colombia, I feel like stomping my feet and pouting that I still want more, that I still need to experience more places, like the Zona Cafetera (I picture myself running in the hills between the coffee trees and then finding a nice spot to sip a cup), the dramatic highlands of Los Nevados National Park, and one of the big turn-around stories of the last decade, the revitalization of Medellín. In my mind, I take a walk through the city, the weather sunny and inviting (Medellín is also known as The City of Eternal Spring). I pass through Plaza Botero, where the work of the city’s most famous sculptor, Fernando Botero, is on display. I stop to admire the marshmallow-round figures: squat men in hats, rotund horses, and buxom women. Perhaps, after striking up a conversation with some Paisas (as locals are known) at the plaza, I’ll head over to the Parque de los Deseos, the Park of Desires, in Medellin’s northern zone, a modern and welcoming meeting place with cool buildings and lots of space for socializing. Friday nights belong to the university students, who take over to celebrate the end of the school week, while on Sunday evenings, children arrive in droves. If I’m not tired of parks, I can visit the Parque de los Pies Descalzos (Barefoot Park), which features green spaces, sand, and water fountains before moving on to the 14-hectacre botanical garden bursting with flora. Even in my imagination, I’m tired from all the walking, so I find myself a nice outdoor café to enjoy a double espresso, watch the people pass, and write down my impressions of a colonial city that has reinvented itself yet respected its historical and architectural roots (Medellín was voted the Most Innovative City of the Year in 2012). If I decide that I’ve had enough of the city then I can head a short distance out of town to the hills to hike, mountain bike, or just sit and admire the views. I’m not there yet, of course, but in a strange way I’m glad Colombia is still on my bucket list. It gives me something to look forward to. Esperame, Colombia. 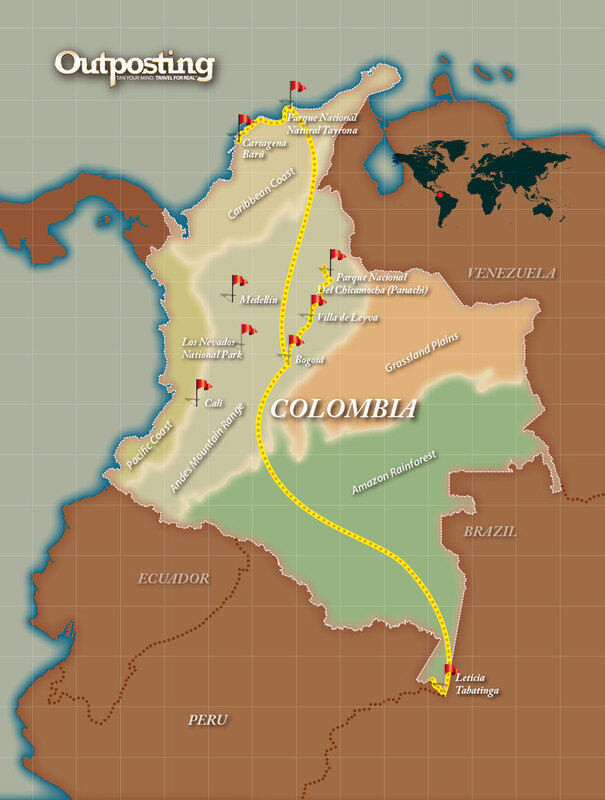 Esperame (wait for me, Colombia, wait for me).